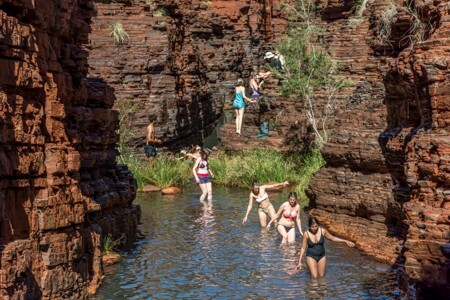 Karijini National Park is located in Pilbara region, Western Australia, just over 1000 kilometers from Perth. 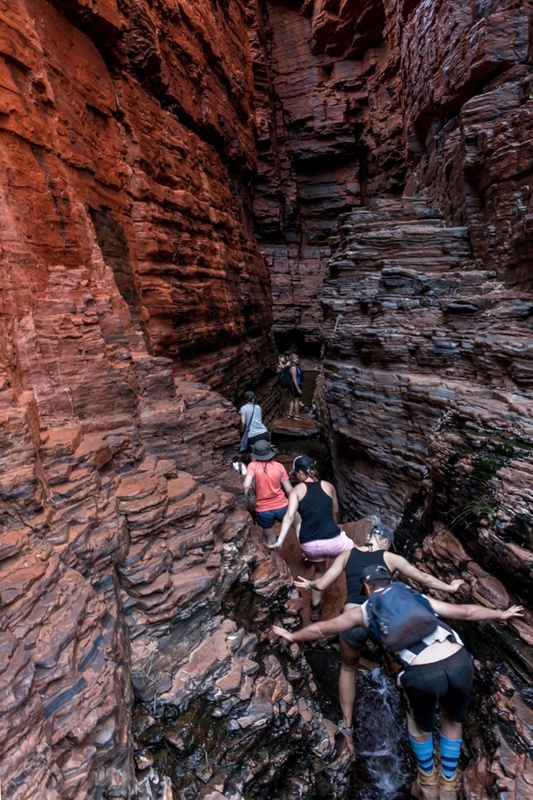 For its canyons, its waterfalls and its natural swimming pools, amongst rocks that have billions of years, Karijini is one of the most spectacular and interesting places of Australia (and perhaps, of the world), although the destination is still unknown to mass tourism. How to get to Karijini? 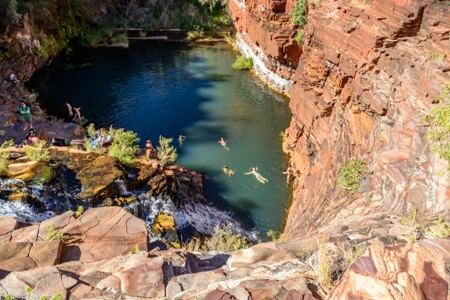 Karijini National Park is located in Western Australia, about 1000 kilometers north of Perth, in the rugged Pilbara region. 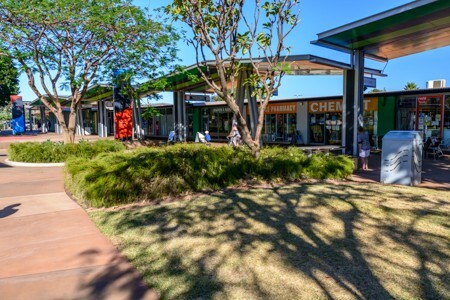 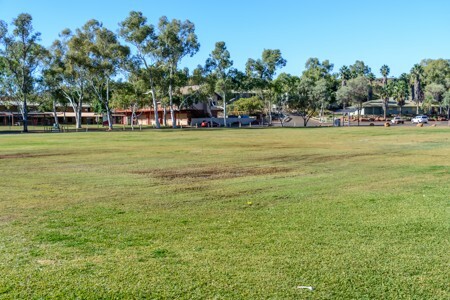 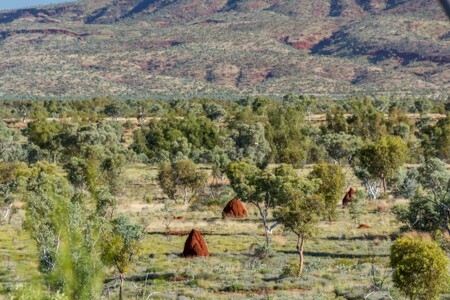 It lies on the outskirts of the Outback (the Great Desert that occupies much of Australia's hinterland) . 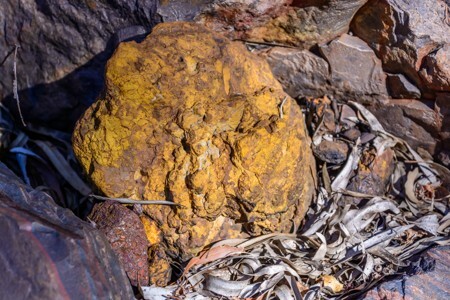 The nearest airport, about 100 kilometers away, is Newman, while the last inhabited town before getting in the middle of nowhere, is Tom Price (in these photos), a mining center that bases its economy on the extraction of iron from a very rich soil. 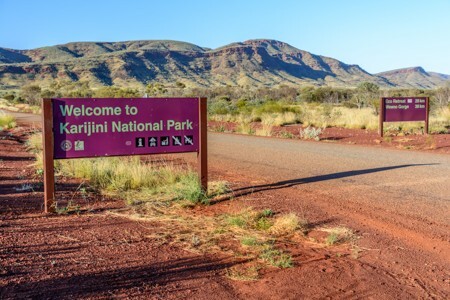 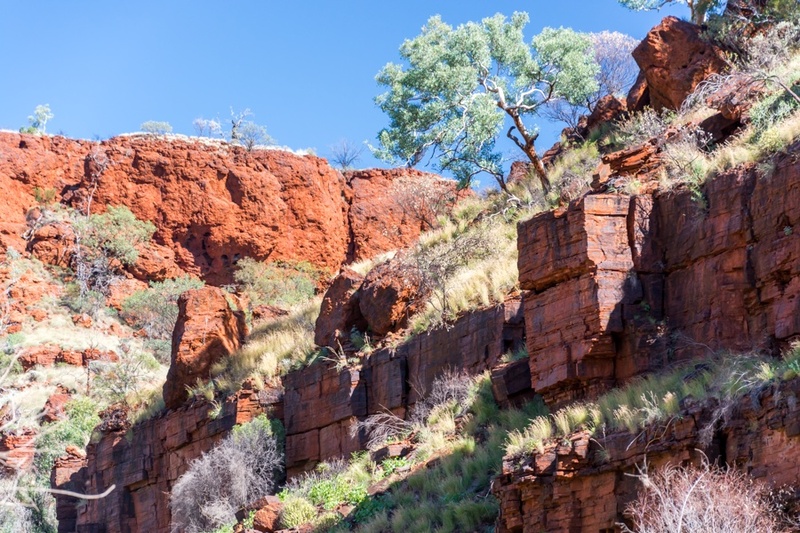 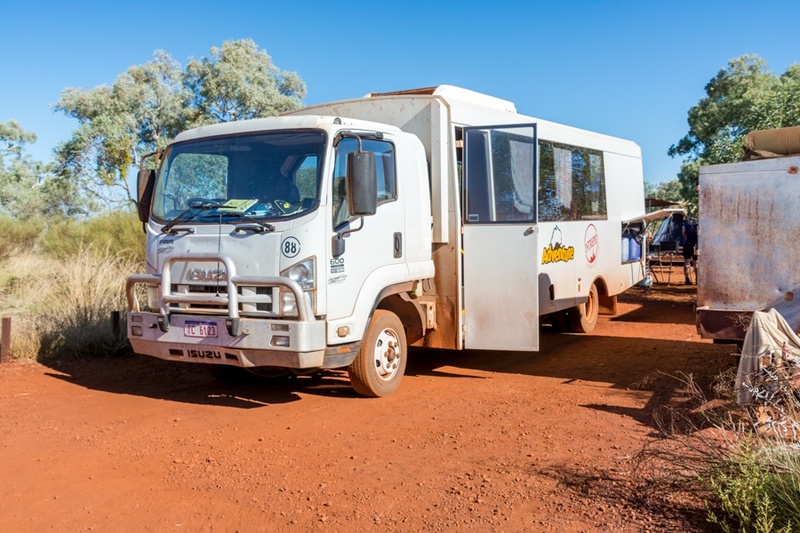 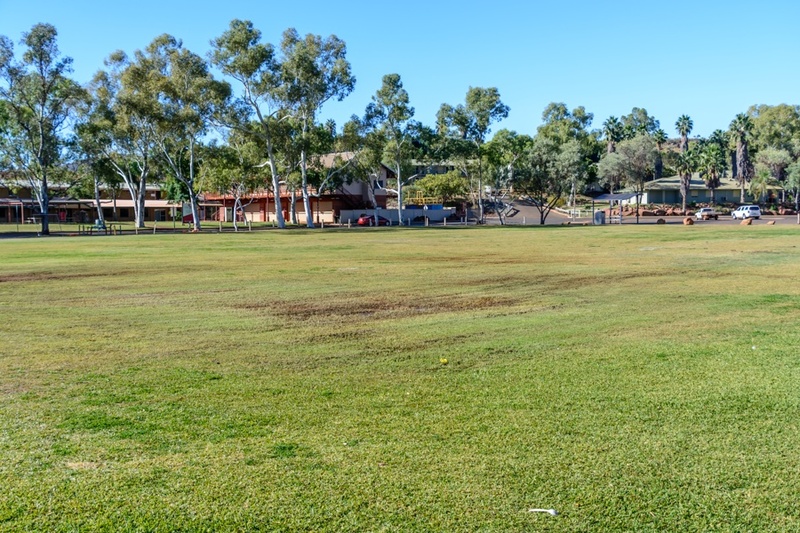 Regardless of how you will get into either of the gateway city, the best (and probably the only) way to get around in Karijini, is to rent a car: although most of the roads are unsealed, a regular 2WD sedan car should be usually fine. The national park of Karijini has been set up for the region's beautiful landscapes, among canyons dug into billions years old rocks, waterfalls and natural swimming pools, making this place one of the most beautiful national park of Australia. 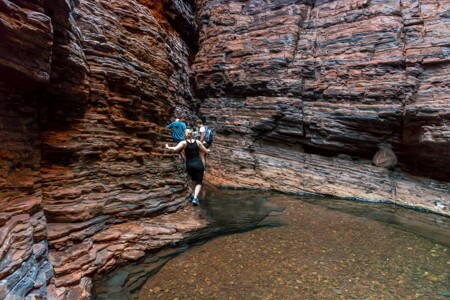 Inside Karijini National Park there are a number of hiking trails which can keep trekkers busy for several days. 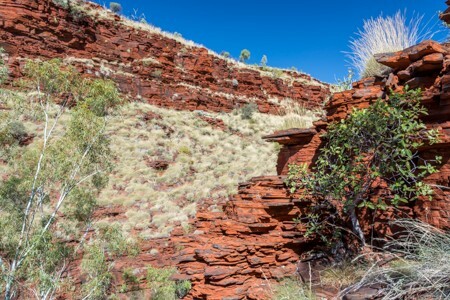 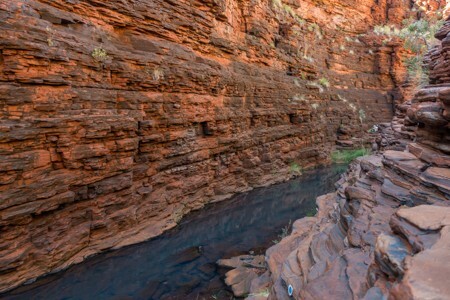 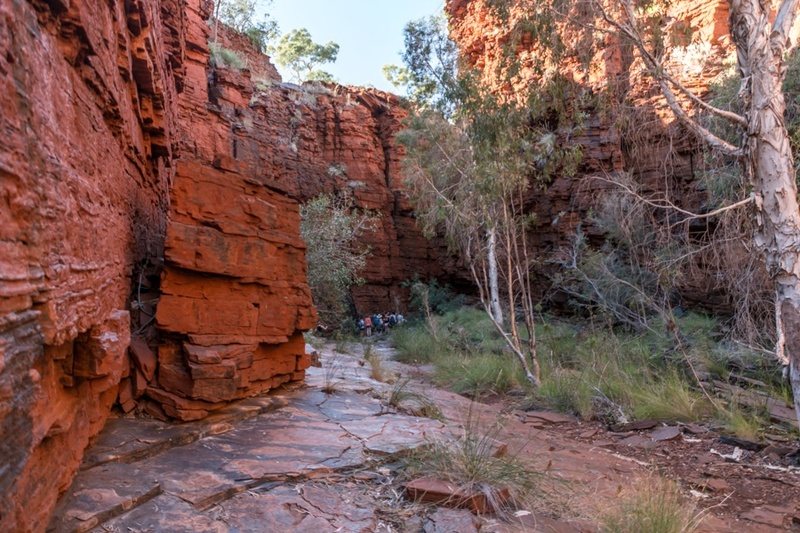 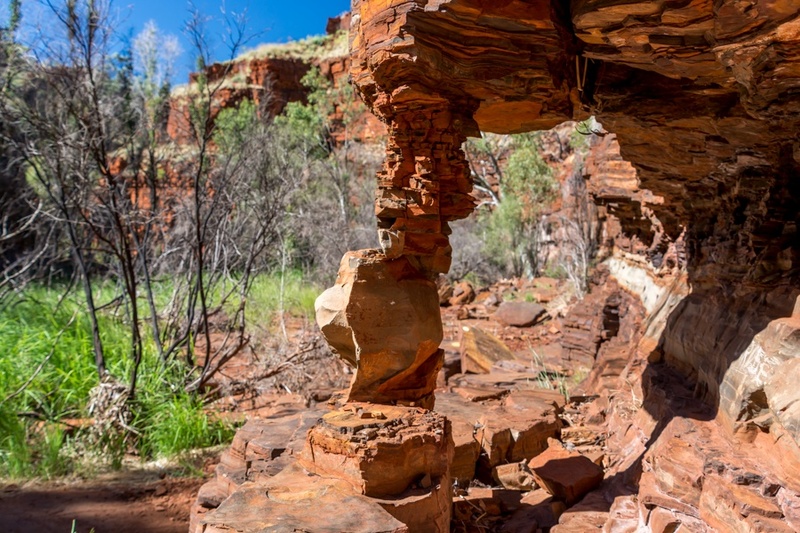 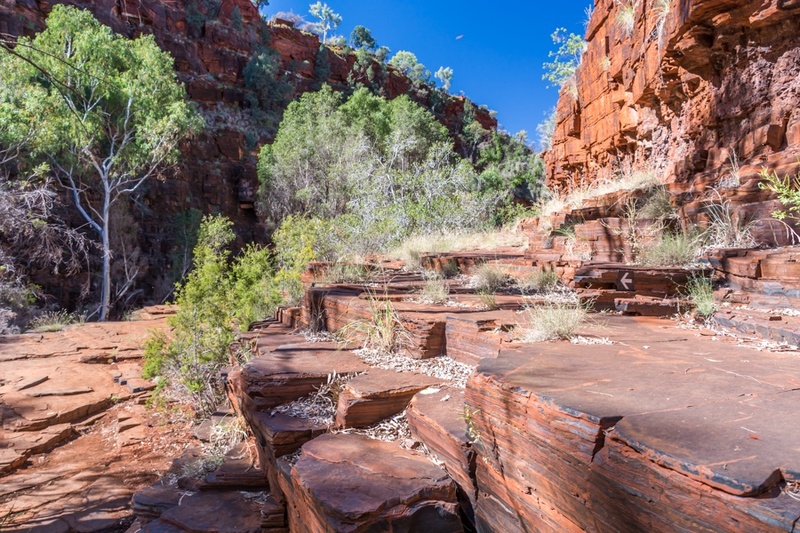 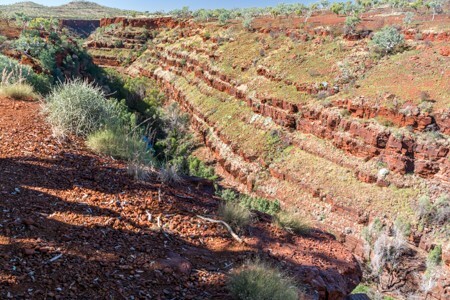 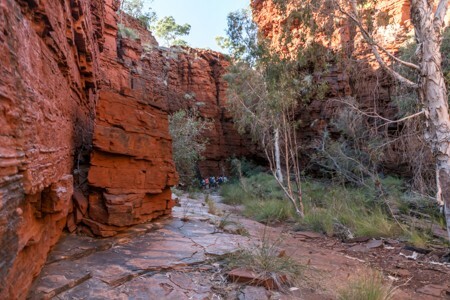 The trails are classified into several degrees of difficulty and walking them is the only way to reach the most spectacular places of Karijini. 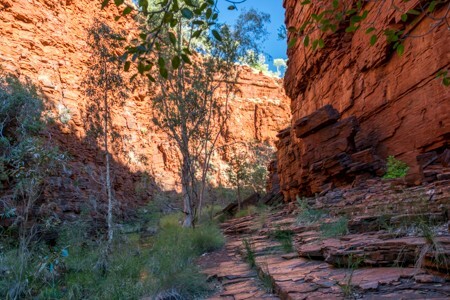 So, let's start with the easier path that leads to Dales Gorge after going down into a canyon (although this trail is one of the easiest, the walk is in any case quite demanding and not suitable for people with mobility problems, as it requires good legs and some help from the arms too). 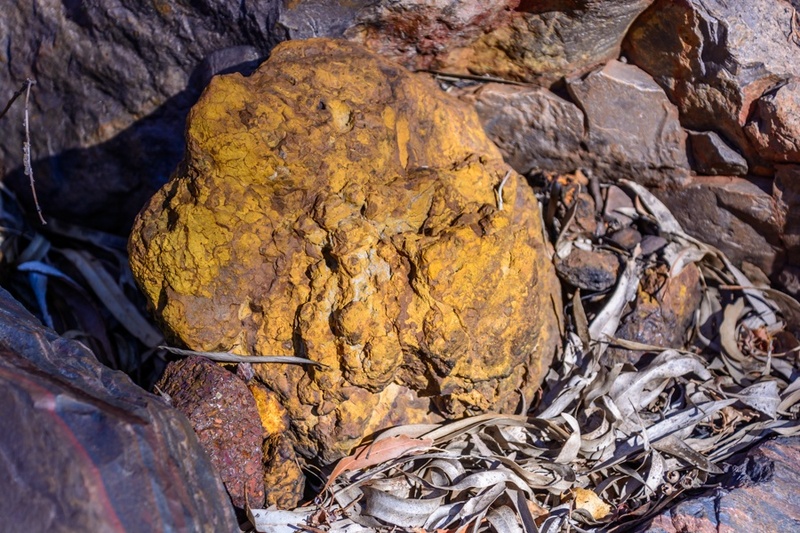 Walking through the trails of Karijini, it's not unusual to spot yellow minerals, with the color due to ocher. 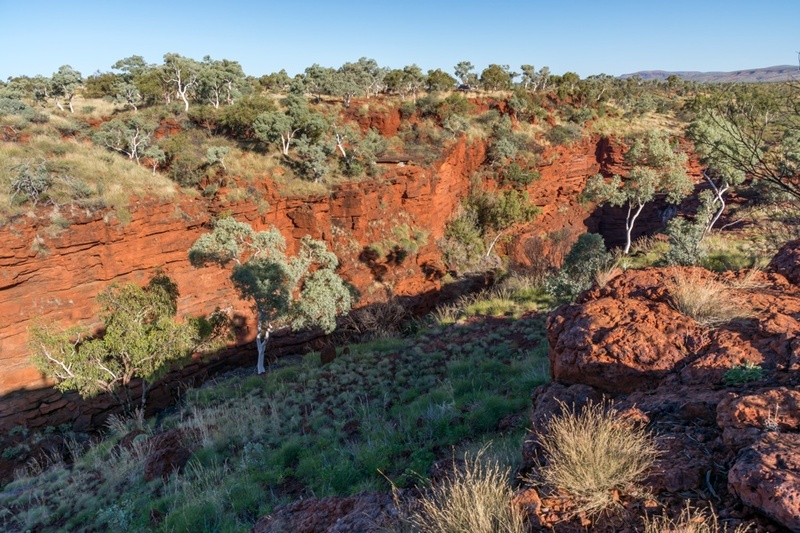 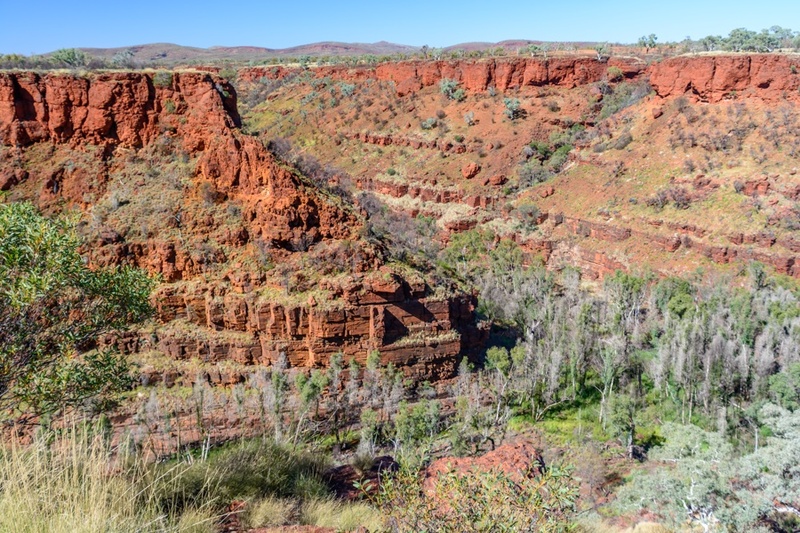 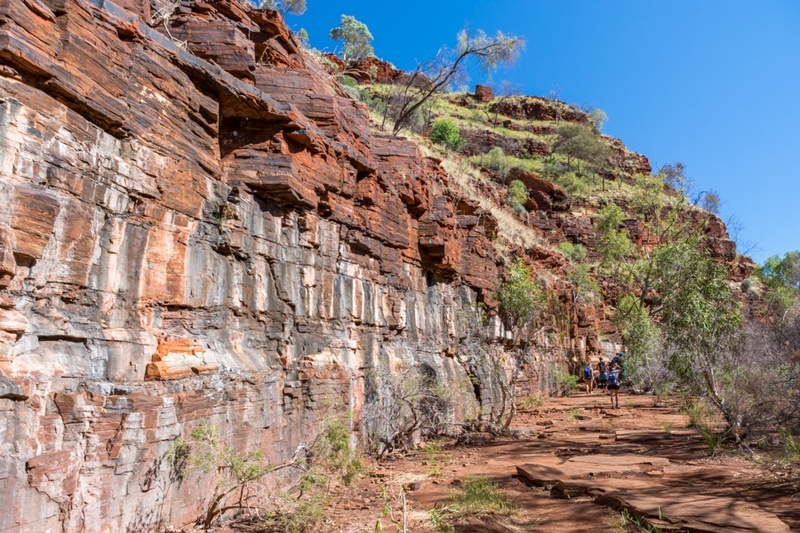 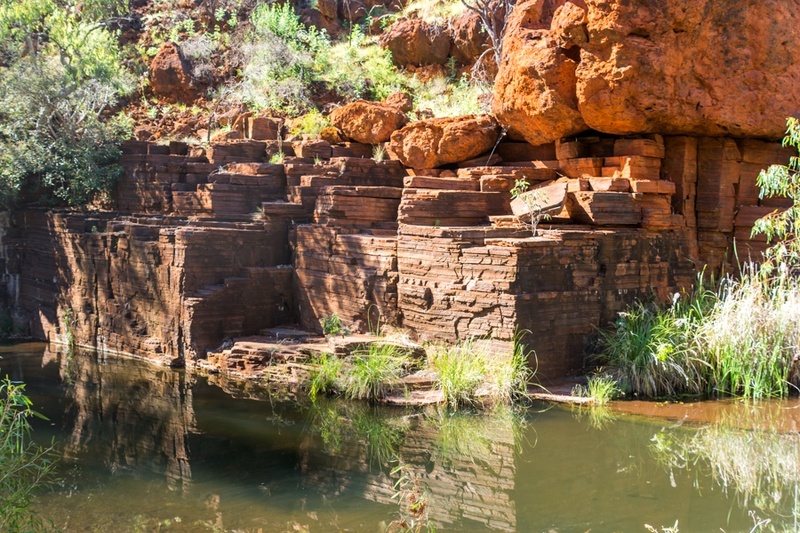 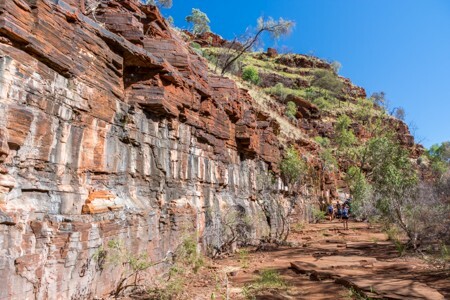 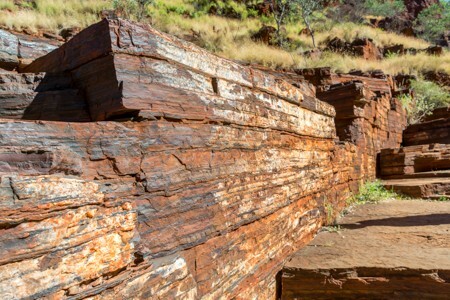 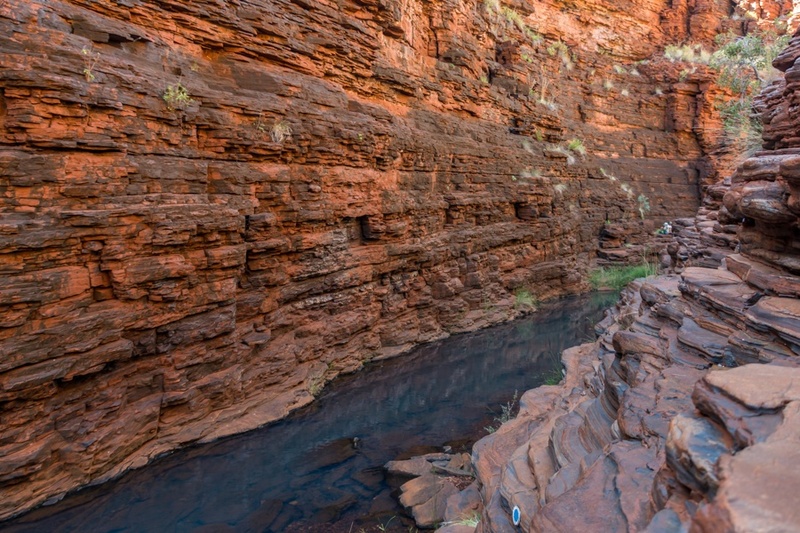 The walls of the canyons in Karijini are an open book on the geological past of the planet: it is estimated that the oldest rocks we can observe, are up to 2.5 billion years old. 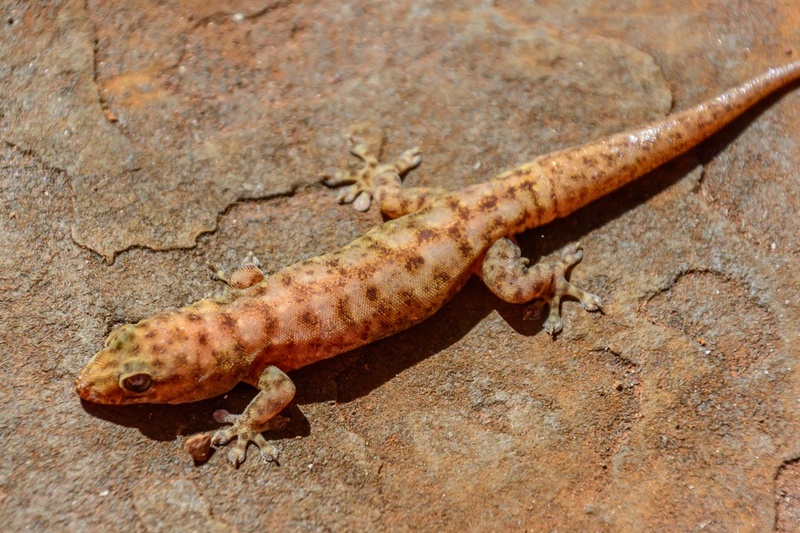 Karijini is also important for the wildlife it hosts, such as this gecko with a color very similar to that of the rocks. 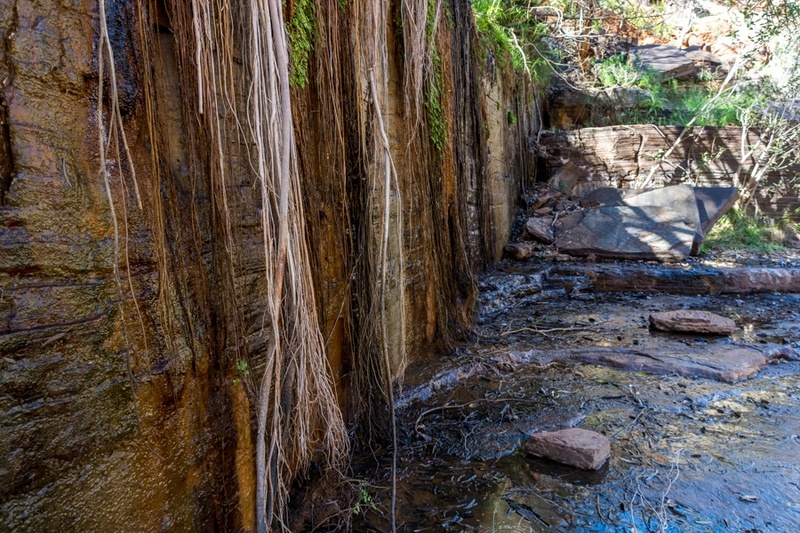 What are we looking at, are the ruins of an ancient Inca or Maya temple? 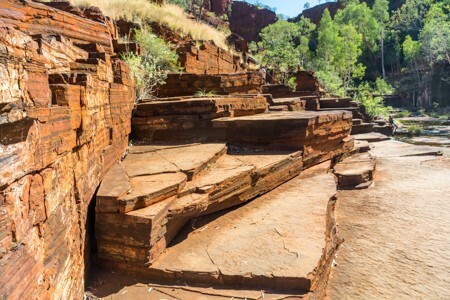 None of the two: this curious landscape was created only by time and nature, thanks to the action of the erosion over millions of years over a mixture of rocks having different hardness. This has produced steps, walls and floors that seem built by an ancient civilization. 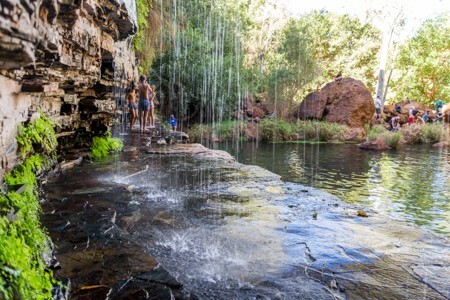 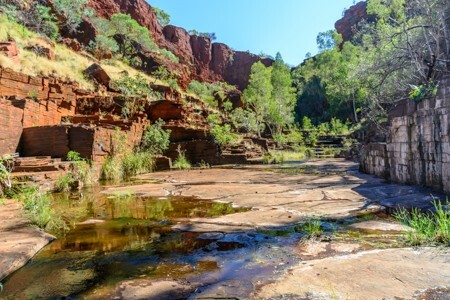 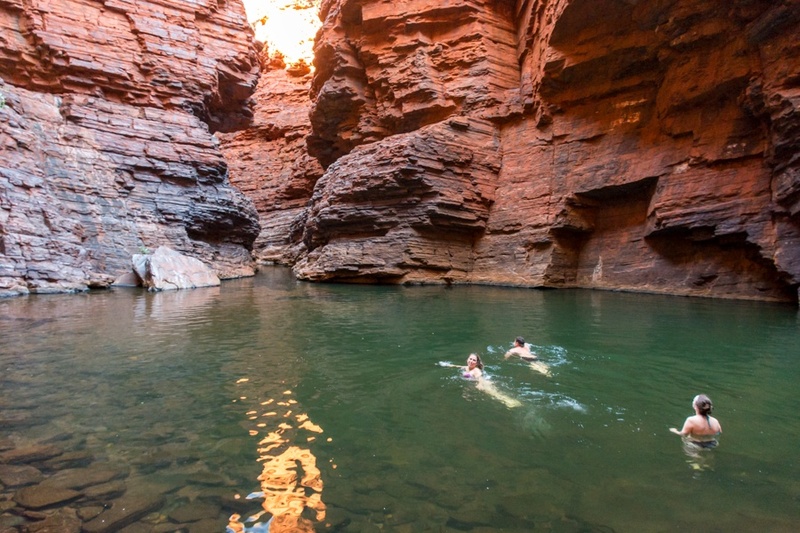 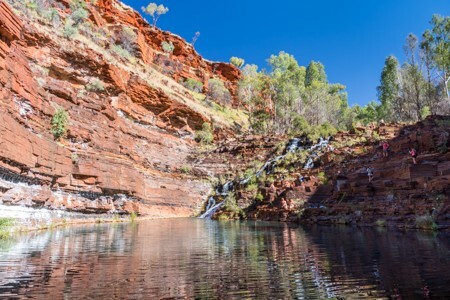 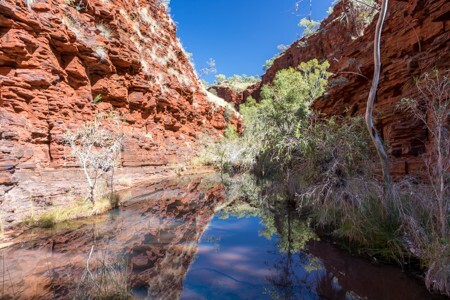 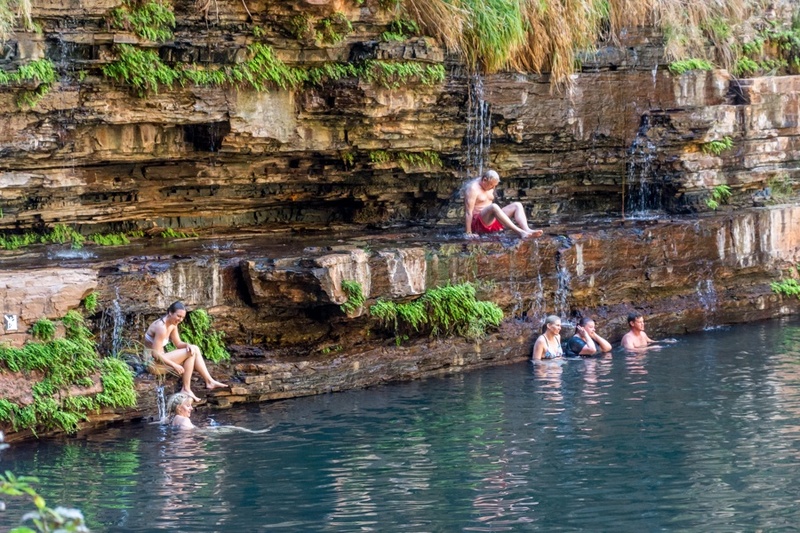 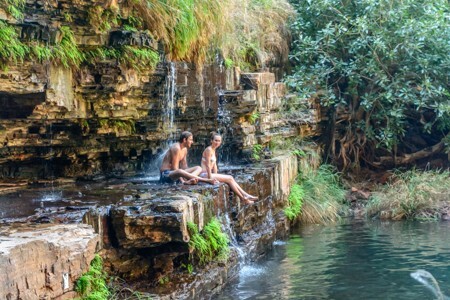 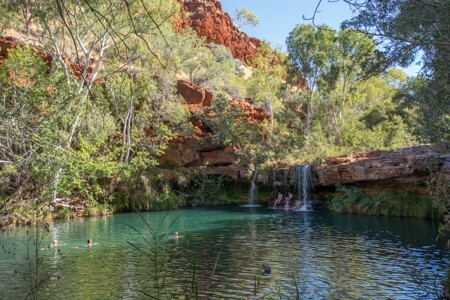 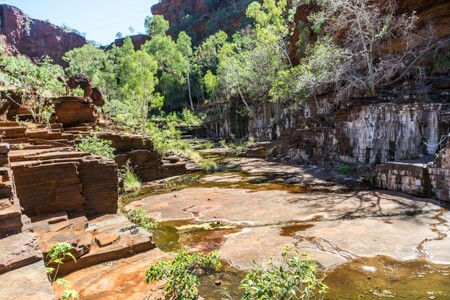 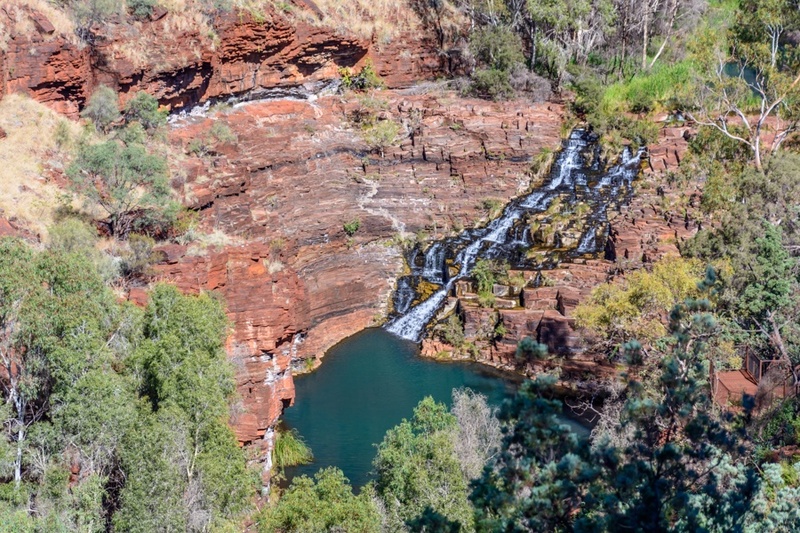 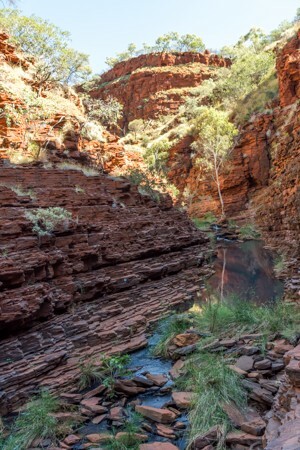 The Dales Gorge trail leads to a beautiful natural swimming pool, with the water that at the beginning of southern winter (the best season to visit Karijini) is still abundant and not too cold. The beautiful natural pool at Dales Gorge, in Karijini National Park, where hikers can have a swim or have a shower under the waterfalls along the canyon's walls. A tourist having a shower under a natural waterfall at Dales Gorge, in Karijini National Park. 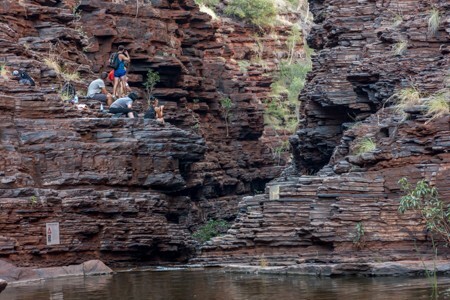 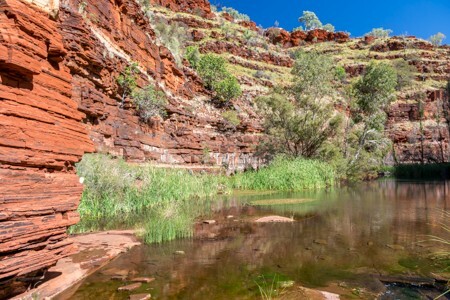 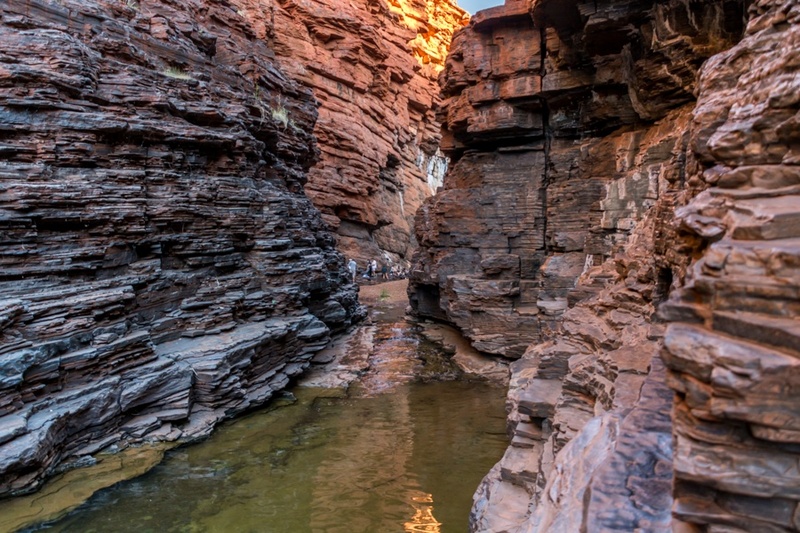 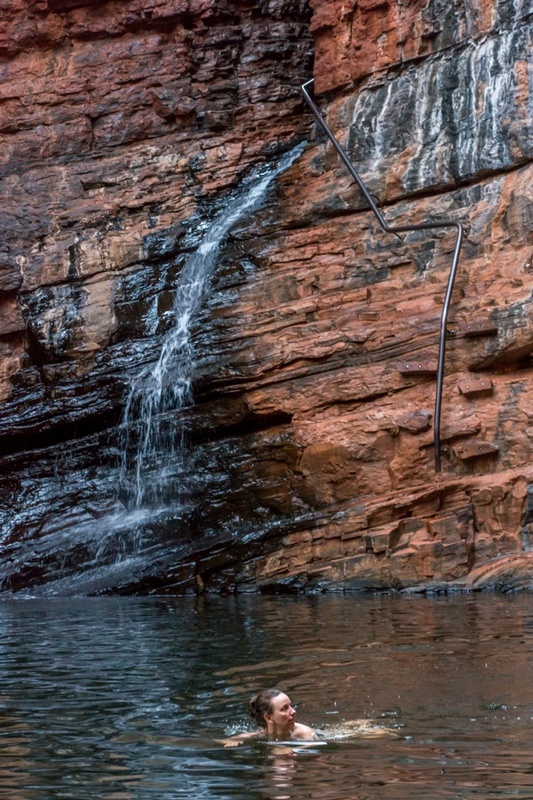 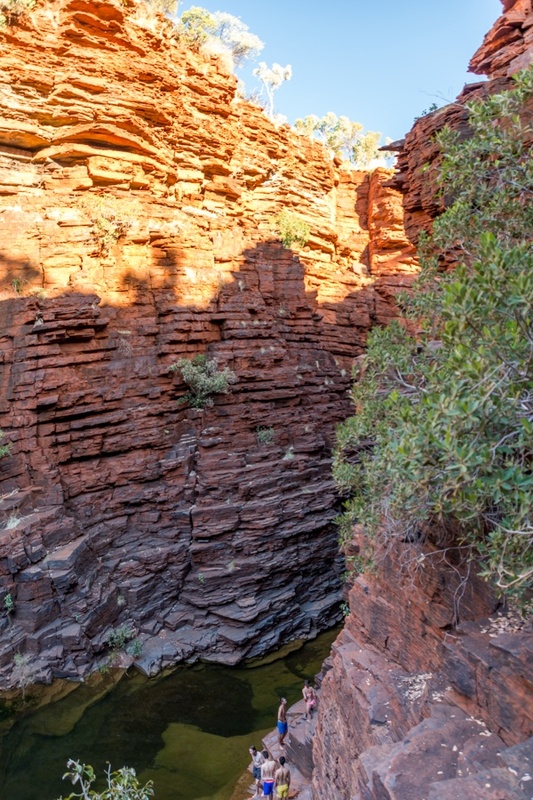 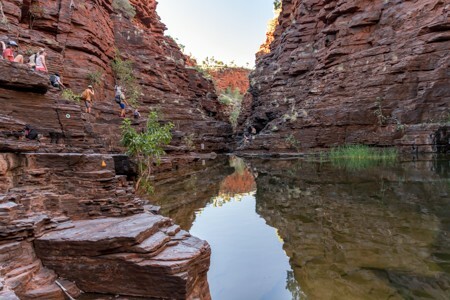 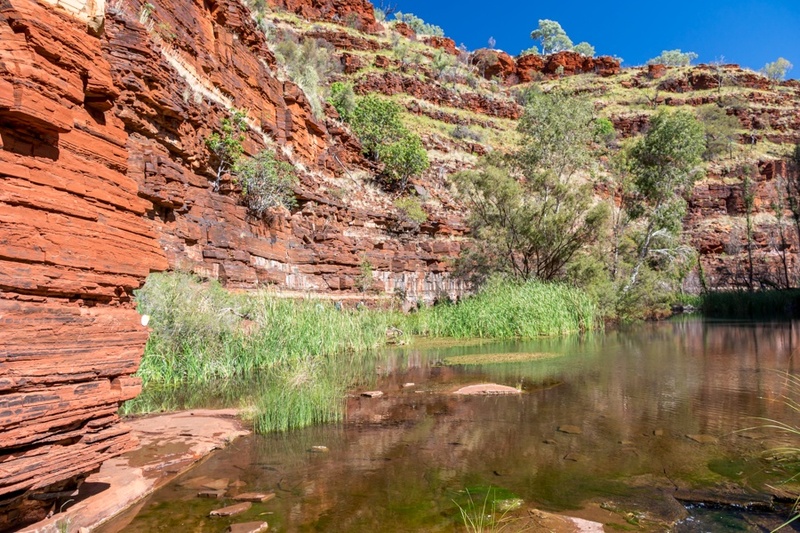 After relaxing in a natural pool, the trekking in Karijini continues between narrow canyons, streams and small lagoons. 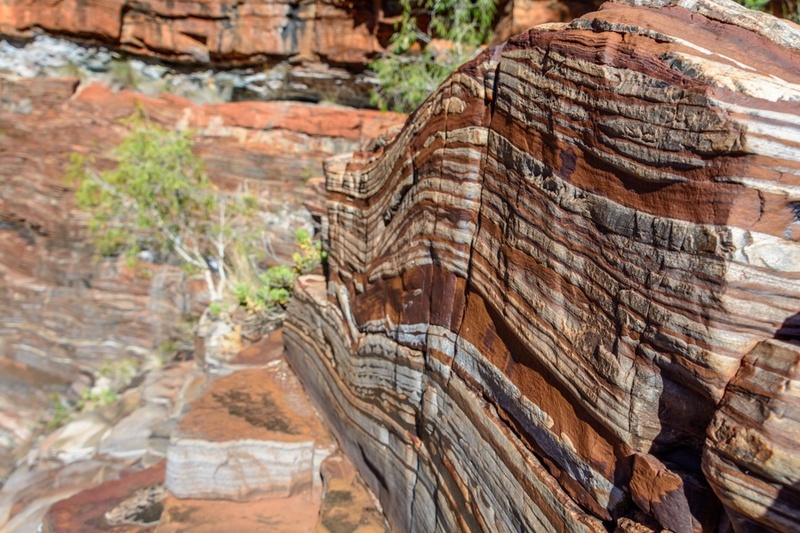 The beautiful patterns on the rocks in Karijini. 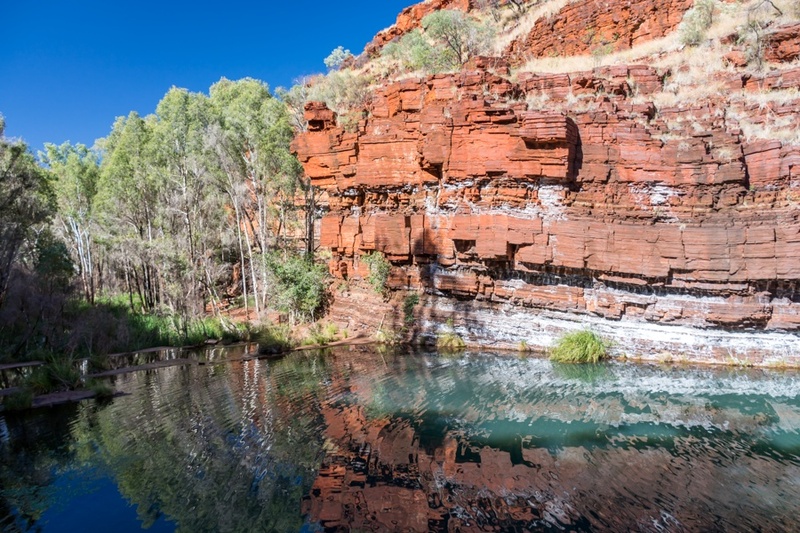 ...and a few minutes later, another beautiful one. 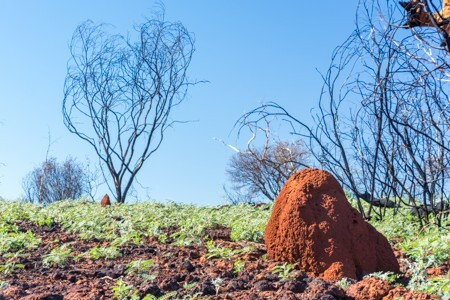 The landscape outside the canyons is the classic Australian's, with huge termite-mounds. ...before getting into a canyon, so narrow that it rarely receive full sunlight. 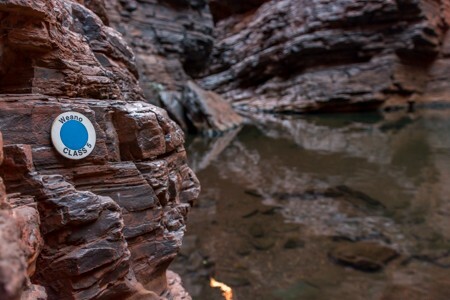 The trail markers remind us that we are trekking a class 5 path: this kind of walks requires utmost attention and some good sense, in addition to excellent ankle-closed shoes and a decent agility. 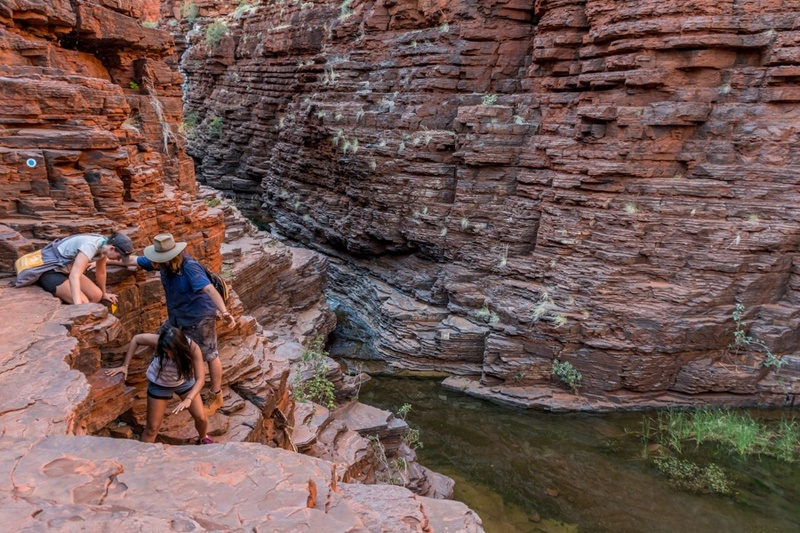 The rocks are slippery and visitors shouldn't walk after a rain shower: accidents, even under normal conditions, are quite frequent and organizing a rescue is very complex (there is no mobile phone coverage in the national park so far). 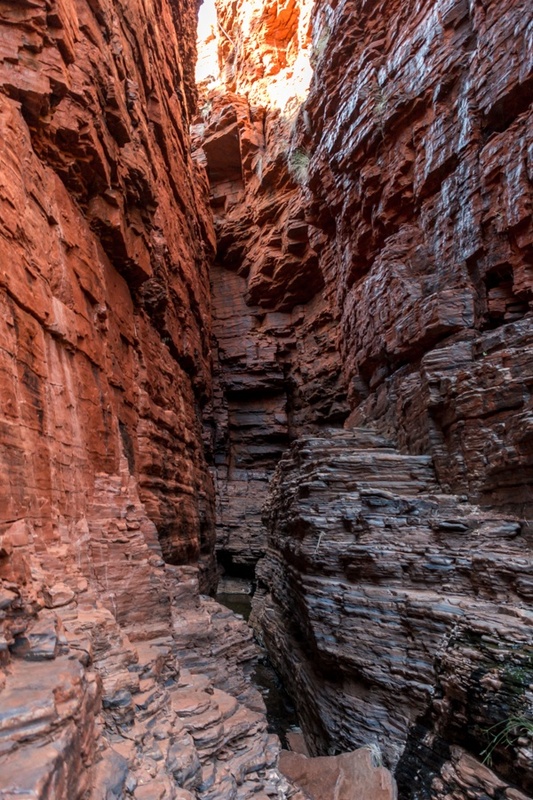 ...so narrow that visitors can touch both the walls of the canyon at the same time. 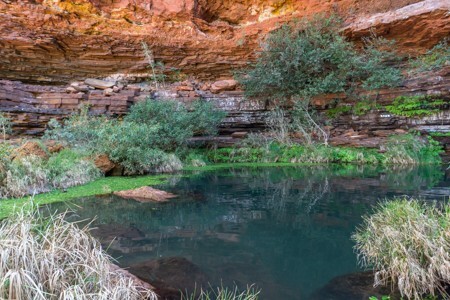 The canyon ends into a fantastic natural swimming pool where visitors can have a refreshing swim. 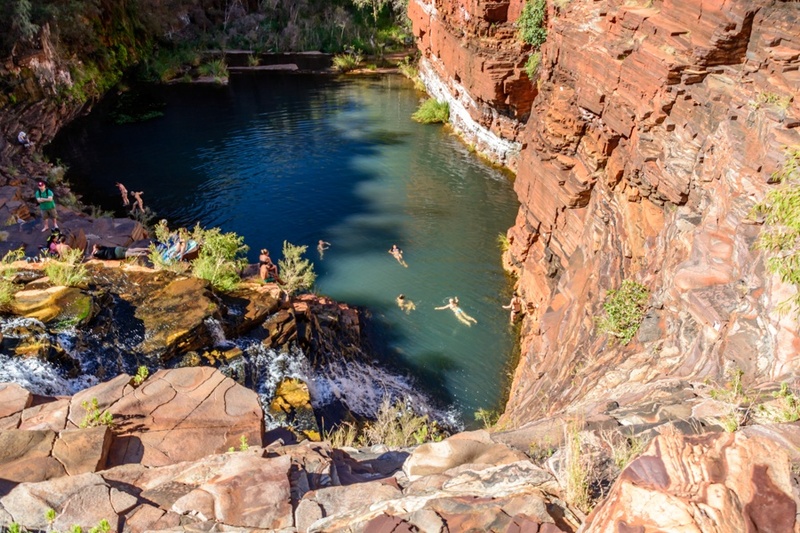 The beautiful natural swimming pool at Weano Gorge, in Karijini National Park. The waterfall that feeds the natural pool, and the handrail to be used to descend into the gorge. After visiting Weano Gorge, it is the time for Hancock Gorge. 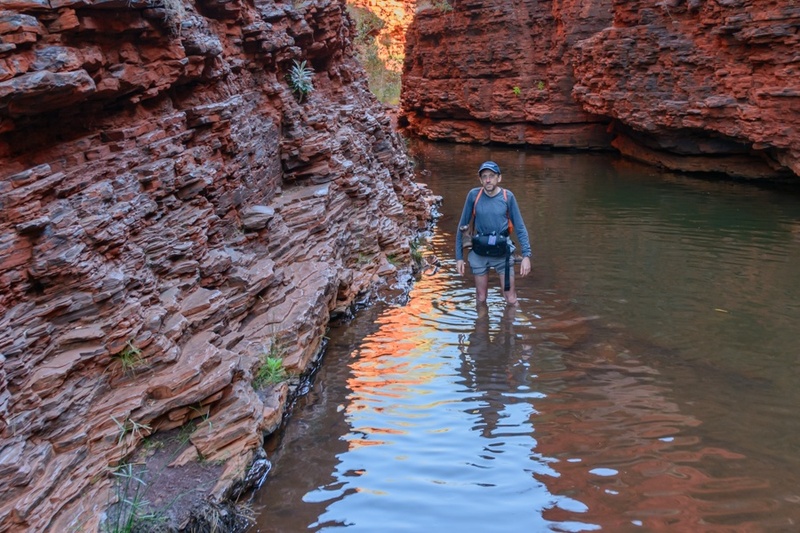 At the beginning of the winter (the best time to visit Karijini), the water level of some lagoons to be crossed, is first to the knees, then to the neck, making it impossible to carry non-waterproof cameras. The trail to Hancock Gorge. And it's just before sunset, after a busy day, when we go down into another canyon to explore Jofre Gorge. 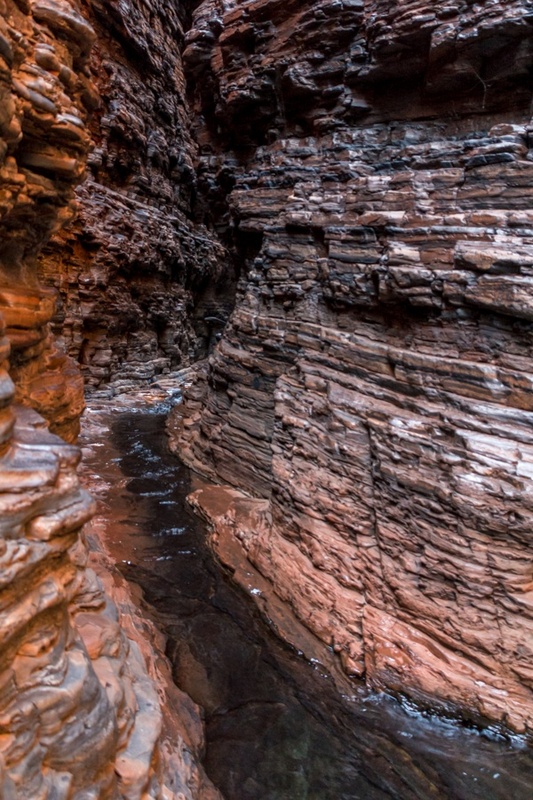 A 360 degrees panorama of a canyon leading to Jofre Gorge. 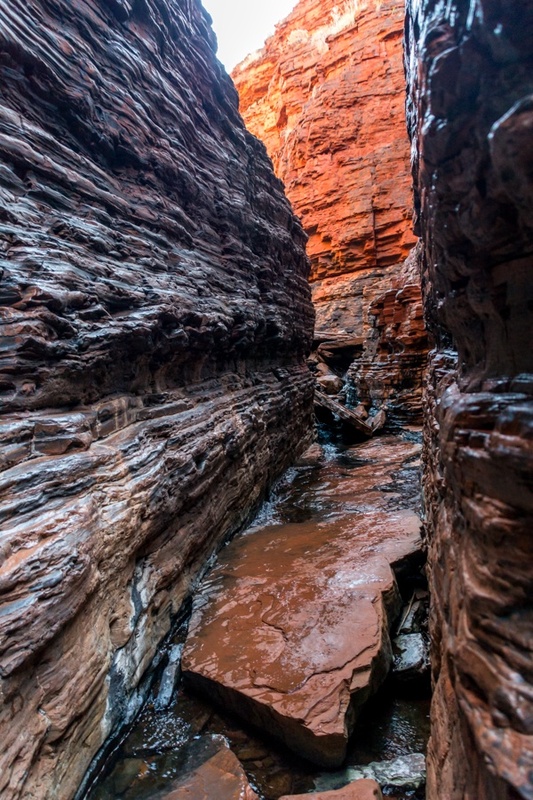 More photos of Jofre Gorge from the bottom of the canyon. 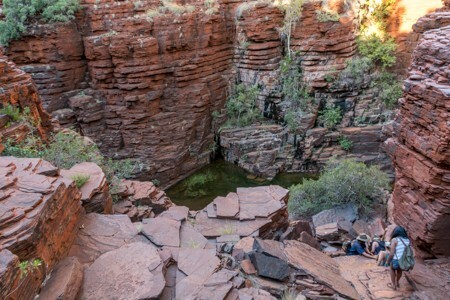 Where to stay in Karijini? 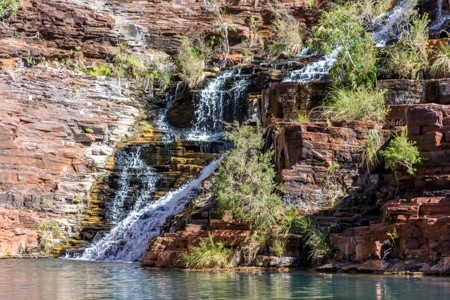 Karijini National Park is still a very wild area without hotels, therefore, if you do not want to spend a few hours every day commuting between Tom Price and the starting point of the trails, the only option is to use campsites. 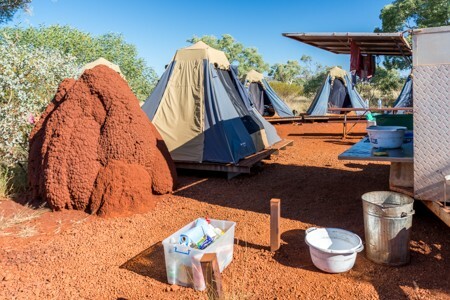 Some of them are equipped with permanent tents and luxury tents option is also available (but very expensive).